Free shipping. Buy direct from HP. 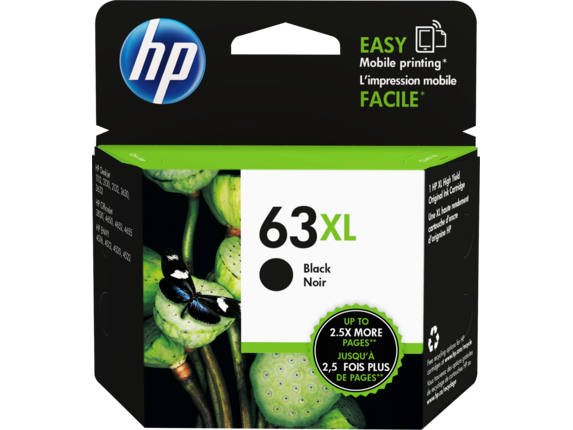 See customer reviews and comparisons for the HP 63XL High Yield Black Original Ink Cartridge. Upgrades and savings on select products. Easily complete your projects. More accurate alerts can help ensure you don’t run out of ink at the wrong time.Performance you can count on—produce high-quality prints throughout the life of your cartridge.Get the HP quality you trust with fraud protection that helps ensure your prints are consistently outstanding. Choose Original HP ink cartridges specially designed to work with your printer.Make an impression with Original HP ink cartridges—designed to deliver crisp, sharp text.High-speed performance—Original HP inks are designed to help you print fast without sacrificing quality.Rely on Original HP inks for durable black-and-white prints that resist fading, dry fast, and last. Save time and receive notifications when your cartridges are running low.Print more for less with Original HP high-yield ink cartridges.The easiest way to print from your smartphone is even easier with HP Original ink cartridges.